The economy is not the market and when it comes to managing our finances the important point to remember is that we should ALWAYS ensure that our portfolios are robust to withstand substantial downturns. There are still people out there who believe that the BLS lies about inflation stats and that all the data is manipulated. But I have some hard truths for the inflation truthers. The FIH, in a nutshell, says that capitalist economies will, at times, deviate from equilibrium into substantial inflations and deflations. In other words, booms can beget booms which can beget busts which beget bust. Here are some things I think I am thinking about. Modern Monetary Theory (MMT) is a theory of economics that attempts to explain how sovereign currency issuing nations operate within the scope of the macroeconomy. The government issues debt in its current form, but could theoretically issue nothing but money. In that sense, government liabilities can be properly referred to as money or debt, but should not be confused with equity. FNFG First Niagara Financial Group Inc.
Redemption was just posted to Cullen Roche's personal blog. Everyone deserves second chances in life including Tiger Woods win The Masters today. The obvious investing corollary here is that good investing is always the process of incremental progress by learning from mistakes. The Le’Veon Bell drama has created some financial excitement in the NFL. When you get fairly good at running you reach a point where you achieve what I would describe as a “peaceful pain”. Financial Advisor with the Goetzman Group in Alexandria, VA managing nearly $500 million in total client assets. Being successful in the modern world of finance requires a more in-depth understanding of our global economies on a macro level. What does a shifting demographic cycle mean? How does the explosive growth of emerging markets matter? Why does the world's population affect my portfolio? Does the global monetary system impact my results this year? How does govt intervention in markets impact my strategy? 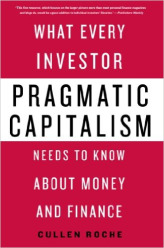 In Pragmatic Capitalism, Cullen Roche explores how our global economy works and why it is more important now than ever for investors to understand macroeconomics. Roche combines his expertise in global macro portfolio management, quantitative risk management, behavioral finance, and monetary theory to explain to readers how macroeconomics works and provides insights and suggestions for getting the most out of their investment strategies. This book uncovers market myths and explains the rise of macroeconomics and why it impacts the readers' portfolio construction.